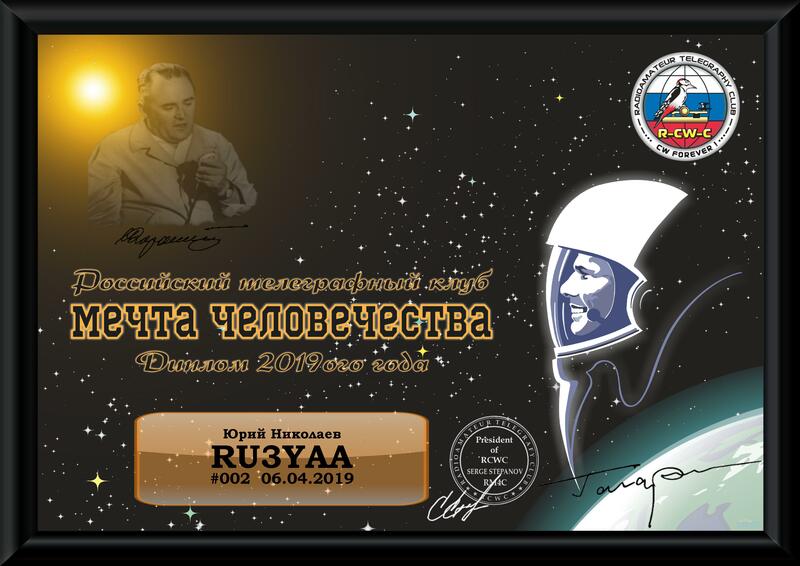 During the period since April 4, 2019 (00:00 MOSCOW TIME) till April 12, 2019 (23:59 MOSCOW TIME) working on air it is necessary to score 58 points (by number of the years which passed from the date of the first flight in space). Type of radiation: telegraph (CW). Bands: 10 m, 12 m, 15 m, 17 m, 20 m, 30 m, 40 m, 80 m and 160 m.
Vladimir and the Vladimir Region – the place of death of Yu.A. Gagarin in plane crash. Radio communications with the amateur radio stations using the call signs of temporary use devoted to celebration of day of astronautics bring to the applicant 10 points. Radio communications with other radio fans of Russia, Ukraine and Kazakhstan bring to the applicant on 1 point. The application for the diploma is formed in the form of an extract from the hardware magazine. The diploma is issued free of charge in electronic form. To observers the diploma is issued on similar conditions. The diploma "60 years in space!"